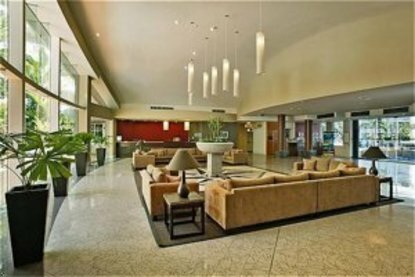 Holiday Inn Cairns is superbly located on the Cairns Esplanade only a five-minute walk from the shopping, entertainment and business center of Cairns. Featuring 237 comfortably appointed guestrooms, Holiday Inn Cairns reflects the ambience of the Tropics with breathtaking views overlooking the Coral Sea and rainforest clad mountains. The unique rainforest Atrium is designed to represent a mini rainforest surrounded by tropical plants, rock pools and Barramundi fish. The hotel also features a relaxing Lobby Bar, bottle shop, swimming pool, heated spa, large sundeck, fitness centre, tour desk, 24-hour room service, high-speed internet access, free undercover parking and Atriums Restaurant, famous for its seafood and international cuisine.